Reporting in with my own bug reports. I'm running the game on SNES9X, if that's a factor. I imagine it is. It's text from the item menu, but you probably already noticed that. I sold the Jackknife and now the Jewel's name displays fine. It's not a major problem; it's not crashing the game, and I can work around it. Fantastic work, by the way. Thanks for releasing this. I fought my first enemy and...well, I got 84 level ups. That is truly bizarre. What emulator are you playing on? Are you playing from a clean save? Thank you for discovering this bug and documenting it. It must be a bug with the updating display. I will see if I can tighten it to work more reliably. To anyone curious about why names are appearing as alphabetic sequences, it's related to how I'm drawing the names and uploading to the SNES' video memory. I am only allowed to modify what's on screen during a refresh, but the game is using the majority of that time doing its own thing, and by the time it reaches my code, I have little time left. So sometimes all of the text gets in, sometimes half of it, or sometimes none at all. In the last batch of fixes, I have been steadily inserting my own redrawing code into the game's interrupt code. It's why I labelled the last fix as experimental. A lot of things can go wrong if you throw off the timing of the game by even a few cycles, and I worry that if I try to do too much in there, it will crash the game. I already spent the last 2 weeks going back and trying to standardize how I do screen updates, since it was much more haphazard. It's becoming more apparent with the display bugs that I will have to move all of my display code into the game's interrupt sequence. 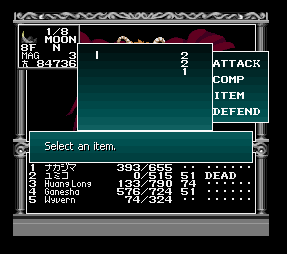 So far, the only things I've changed to run in this manner are the status screens (because of the potentially large number of item names) and the Cathedral of Shadows' demon fusion chart in the latest update. I will attempt to integrate the rest of the code in a similar manner and see how it affects the game. Thank you for your patience. snes9x-1.53-x64, clean save. 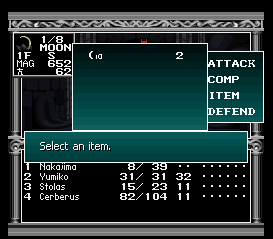 After that happened I reloaded from the save point and the same thing happened against another kind of enemy. Worked fine when I tried other ROM though. When you say "other ROM", what do you mean? And if you are using Snes9X, could you tell me what it says for the CRC32 at the bottom of the screen when you load the game? It should be an 8-character code. And I'm assuming you mean any enemy near the beginning of MT1? Sorry for all of the questions, it's just that I've been unable to reproduce this bug, but it seems like a serious one. I first patched and played a ROM I got from a pack of SNES ROM's I downloaded a long time ago(probably just a bad dump). The patch worked fine with a ROM I downloaded after that. That is good to hear that everything is working now. I will update the top post with some info in case something like this happens to someone else. Thank you. kmt_beta_080914_4.zip going good so far. The only persisting problem from the first beta is the name glitching while saving which effects nothing else that I can tell. 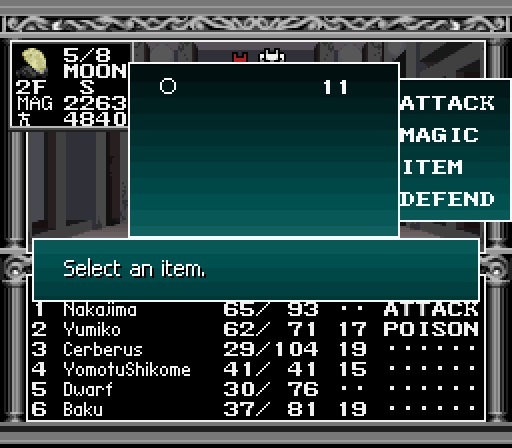 I haven't played much from the beginning since I've been skipping between saves, but so far the only issue is that item names either aren't showing up in battle, or they're scrambled. That is good to hear. I haven't yet been able to work on the save name glitch, but will try to have it fixed as soon as possible. Is this using the latest patch, the 4th one for today? I think this may be another instance where I will have to migrate the drawing code to the core of the game. Please bear with me a little longer, and I should have all of it eventually working without missing or scrambled names. *Edit: I have uploaded a new patch. Please try the 080914_5 version of the patch and see if it fixes the problem. Hello. This is a very good translation. If it helps, I am playing on ZSNES. Keep up the good work! EDIT: Oh, someone else pointed it out too... well, whatever. Thank you for the feedback. I thought I had this fixed in an earlier patch, but it seems that since it's still happening, I will try to tighten up the code that draws the item names. I will post an update once it's completed. *Edit: I have uploaded a fix in the 080914_5 update. Please try that one and see if it fixes the problem. For the record, this hasn't happened to me since the first publicly released beta yesterday. Items (or at least jewels) have showed up for me since version 2. Weird stuff. And yet again, good work. I wish more rom hacks tested like this. Be careful not to burn yourself out, ha. Hello again. The item text issue was a one-shot error; it was cleared once switching to another command. Still doesn't change the fact that it exists. Also, perhaps not a bug and just a simple text issue, but this string of dialogue is missing an A for And at the Medusa introduction. It's an issue related to the timing of the SNES. Sometimes I have enough time to transfer all of the text into memory, and sometimes it doesn't let me. I hope to have solved (or will be solving) future issues such as that with the new experimental code I am working on. Thank you for testing it. And good catch with the dialogue. In an earlier version of my text editor, it had erroneously omitted all capital "A"s from the dialogue and saved it that way. I went back and tried to fix them, but this is obviously one instance I missed. It will be rolled into the next update. Here's another quick text issue; I suspect it's because the text exceeded the box draw area? Correct. I neglected to account for the length of the player's name, which I should have incorporated into the editor. I had only been eyeballing or guessing at it, which is not a reliable way to do it. I'll go back and modify the editor so that it treats player and demon names as if they are the maximum possible length. 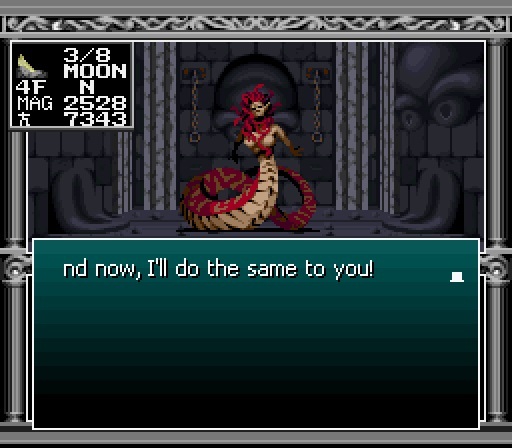 Since you seem to have finished the second area, did you notice if the text from beating Medusa Shadows pushed the EXP and money gains off the screen? No; if it was a subtle issue, I probably wasn't paying attention, but if it was glaring, I would've noticed, and everything went pretty smoothly. Just played a little bit of MTII. Similar to the invisible item name issue, spell names aren't showing up in the COMP menu or in battle. They show up when you view the status in the Cathedral, but that's the only way I've found to see which spells a demon has. So far everything else has been perfect (just got to the second town, about to head into the Princess Hotel). This is awesome and I'm so stoked to be able to play these games. A million thank yous. Thank you for the kind words and feedback. I will see if I can move the spell names into the core code next. It's starting to seem like everything will have to be moved into it, though I'm glad that no apparent side effects have occurred yet with these latest changes. 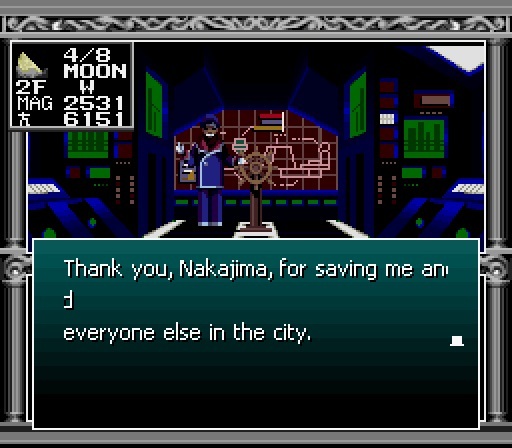 I just wanted to point out that I'm having the same issue with spell names on 080914_5, but with Megami Tensei I (haven't tested 2). 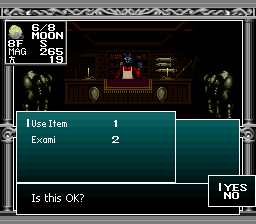 Item names are working fine for me, though, and everything else is looking excellent as well! Thank you so much for your work on this.